To the unenlightened carebear, the Code can be difficult to grasp. Baffling, even. Take, for example, the practice of ganking empty freighters--or even empty pods. Why bother? What could motivate an EVE player to do something like this? Our Agents are more than happy to explain. The answer, as always, is found in the Code. Georgia Armstrong was confused by our Agent's actions. Why do something if you don't get isk for it? To fully understand the emptiness of the bot-aspirant, imagine Georgia's EVEmail was a response to Aaaarrgg sending her a gift (which it was). Why give something to another person if there's no monetary reward? Our busy Agent quickly dashed off several lines of text to get Georgia started on the path to enlightenment. The situation escalated. 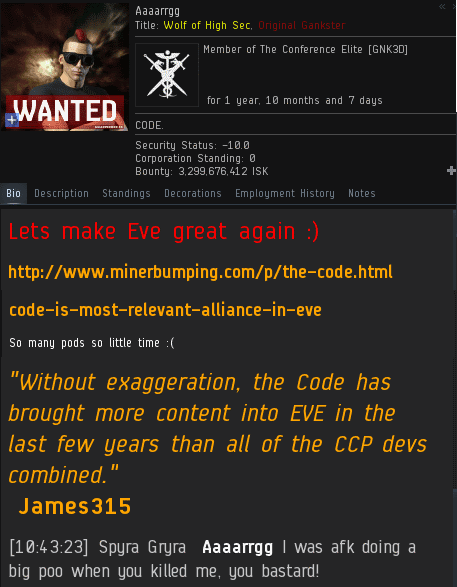 Georgia threatened to forward Aaaarrgg's EVEmail to CCP. If she made good on the threat, it would simply result in another CCP staff member wasting time on a frivolous petition. Though it wouldn't be a complete waste of time--the EVEmail included a link to the Code, after all. 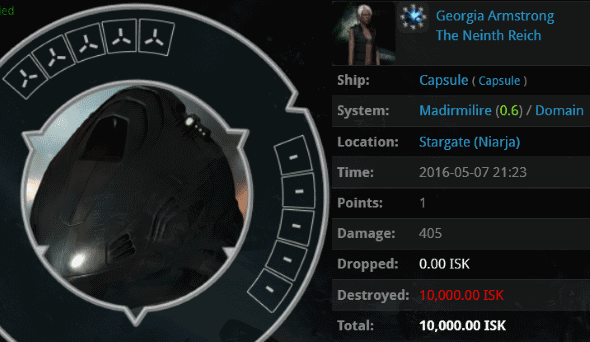 Georgia bristled at the suggestion she could afford the 10 million isk. Like so many others, she claimed to be a helpless newbie. Her story didn't hold up, though: The "newbie" lectured Aaaarrgg on the EULA and had previously said she'd heard about CODE. members being banned. They teach that stuff in the tutorial now, do they? Aaaarrgg indulged Georgia's claim of newbie status and educated her. With an impressive succinctness, our Agent taught Georgia many things about EVE and life. Earlier, Georgia had relied on CCP to fight her battles. Apparently she believed Aaaarrgg when he told her that the EULA hadn't been broken. Somewhere, a GM's workload was lightened by one petition. But the crushing of Georgia's hopes for salvation from CCP left a void within her. What would she use to fill it? "Yo momma" jokes? As ever, Aaaarrgg steered Georgia in the right direction--if only she'd listen. Unable to hide behind CCP and phantom EULA violations, Georgia was reduced to making tastless comments about our Agent's mother. The carebear could've apologized when she realized she'd wrongly accused Aaaarrgg of breaking the rules. Instead, the "newbie" was unmasked as a rebel sympathizer, her toxic attitude and hypocrisy revealed for all the world to see. Carebear bot-aspirants like Georgia are, in fact, filled with self-loathing. They are fully aware of - and despise - their own weak and money-grubbing natures. When they encounter one of our Agents - assured, happy, free from financial distress and the prison of bot-aspirant behaviour - that fearful anger and bitterness is drawn forth from them in predictably violent fashion. Unable to accept their sense of their own inadequacy (for that would increase it in a never-ending downward spiral), they project their ire onto our Agents, with the result that you see here. This is about more than 'tears'. It is about the fundamental unwillingness of the carebear bot-aspirant to take responsibility for hisher shortcomings and, having faced up to them, to seek help in amending them. But such action requires sincerity; without sincerity all development, all improvement is superficial and temporary. 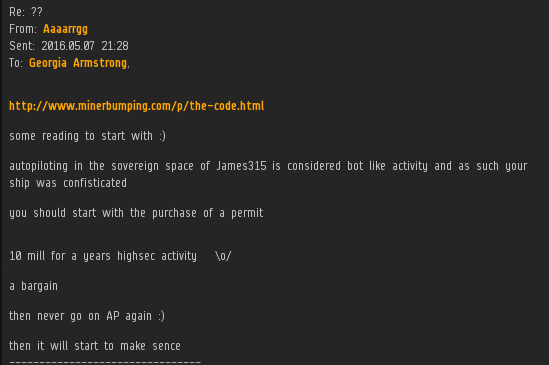 The Code overflows with sincerity. When the carebears are able to discard the papier-mâché edifice of their pride, then (and only then) will the scales fall from their eyes and the darkness be banished from their hearts. Lol, James sent HONOR a mail threatening that he was going to wardec us in 48 hours. Well, its been $8 hours and nothing has yet happened, No wardecs, no nothing. 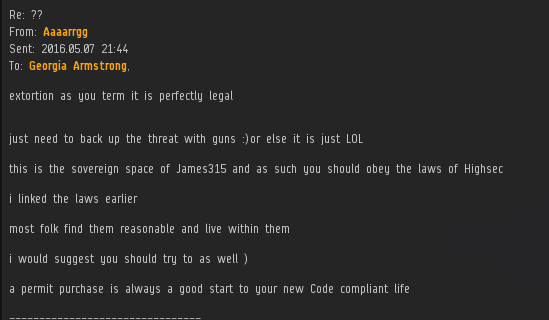 hey Reicher514, if you do get WarDec'ed I believe MC would be willing to shoot the people you don't like for isk. It's been a while since I flew with them, but there wasn't anyone better at making the bad people go away than the Mercenary Coalition. Lol, James sent HONOR a mail threatening that he was going to wardec us in 48 hours. Well, its been 48 hours and nothing has yet happened, No wardecs, no nothing. Im sure you have proof of this claim? Even if there was such a threat made, the miner probably doesn't realize that the New Order doesn't need to use the in-game "Declare War" feature to wardec someone. We can just show up and vanquish our enemies at any time we wish. Thus is the power of the Agents of the New Order and the Code. You two love your video games so much. haha. nerds. hasn't been one code guy that I met that wasn't a neckbeard nerd. Says the anonymous nerd who loves video games so much that he takes the time to read and to post his tears in a blog about a video game. I can sent you guys the EVE mail if you want. Another failure from antiganking. if they stopped the gank this carebear wouldn't have been crying so hard. But because AG failed as normal more tears for the rest of us. Oh... you are still here. What a story for the grandkids. the threat mail has been posted to reddit ....code you are soooo funny. wardec indeed! lmao!! Really? You could not post a link? Hmm, Over the weekend I made several cargo runs through Madirmilire and Niarja, CHODE. slave Aaaarrgg's stomping grounds. All in a DST, several billion ISK worth of goods, mostly piloting AFK while I watched baseball on TV. Looks like CHODE. failed that day. Miner anon, we are not here to serve you. There are many other non-compliant miners that need our assistance. If you wish to be ganked, please schedule an appointment. Otherwise, please calm down. We are very busy winning nonstop daily.